THE GOG BLOG by Rory Spears, Editor and Director of Content. Follow Rory on Facebook, Linkedin and Twitter @gogblogguy. 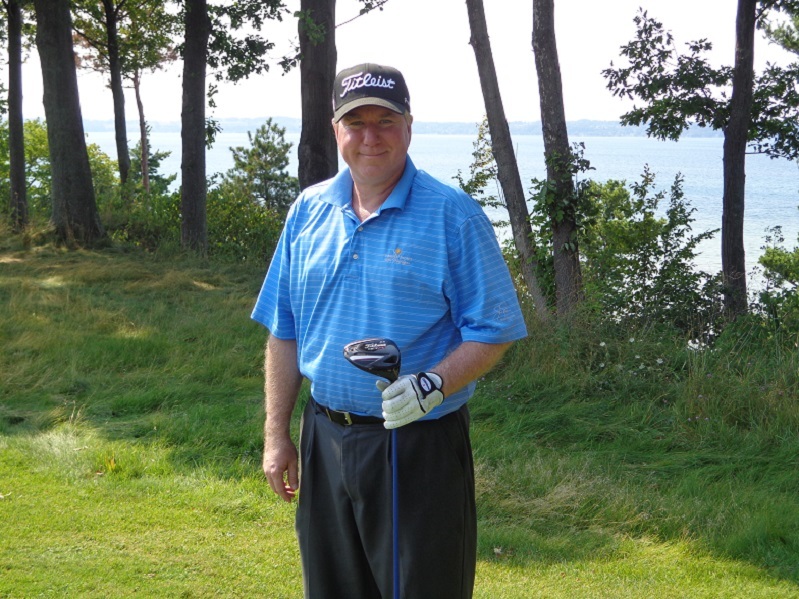 In Michigan at Lochenheath Golf Club. 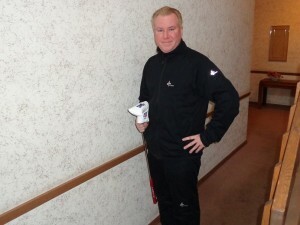 Hello golfers and yes the Gog Blog is out following it’s own advice, of going out to play. It’s been a great week, that started out in Arlington Hts. 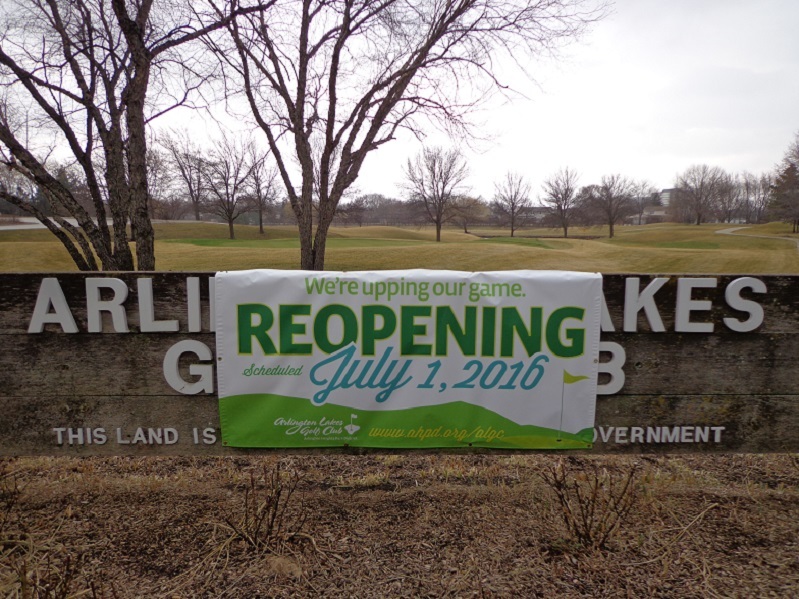 at Arlington Lakes that reopens on Friday. On Friday the entire Golfers on Golf Radio team headed out to Myrtle Beach South Carolina, where we did our live broadcast from. Now I’m out in Michigan for the week, that started at Forest Dunes, with rounds on the new Loop Course. A Tom Doak special that you can play clockwise or counter clock wise. The Black or Red Course, try them both. Forest Dunes still has it’s original design open and it’s in great shape. It’s a Top 100 course on a few lists. The new lodge and villa’s are right on the course and great to relax in between rounds. The trip has now taken me to the Grand Traverse Resort the Home of the Bear Course, which I will see tomorrow. Plenty going on in Michigan, Pure Michigan and it’s pretty darn good. Santee South Carolina, no. Kiawah Island, No. Sea Pines on Hilton Head, no. Not there either. Golfers on Golf heads to Myrtle Beach for it’s first live show out of state. 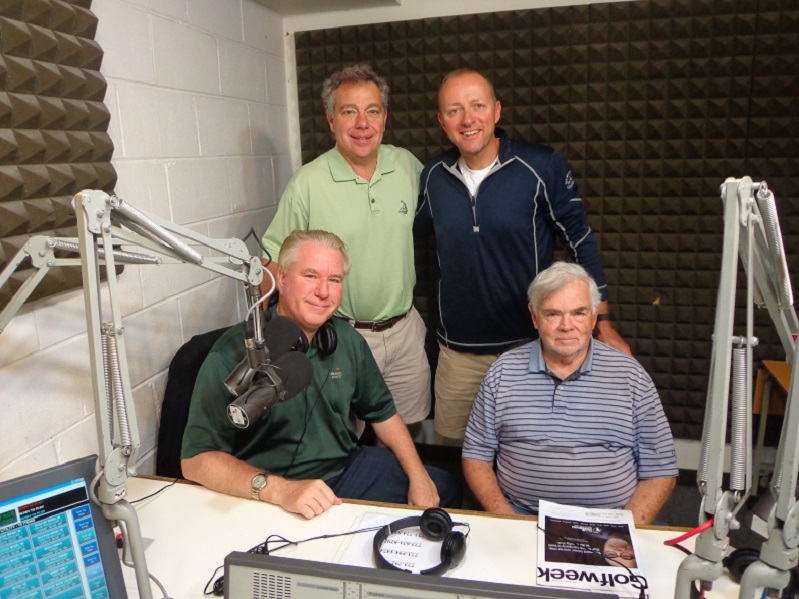 Chicago’s favorite foursome of Mike Munro, Bill Berger, Ed Stevenson and Rory Spears are to Myrtle Beach via Myrtle Beach Golf Holiday, our reports are live at 9 Am on Sunday morning on WSBC Am 1240. A full recap of Myrtle Beach, what we like, what we saw and where you need to go in one of America’s golf capitals. THE GOG BLOG by Rory Spears, Editor and Director of Content. 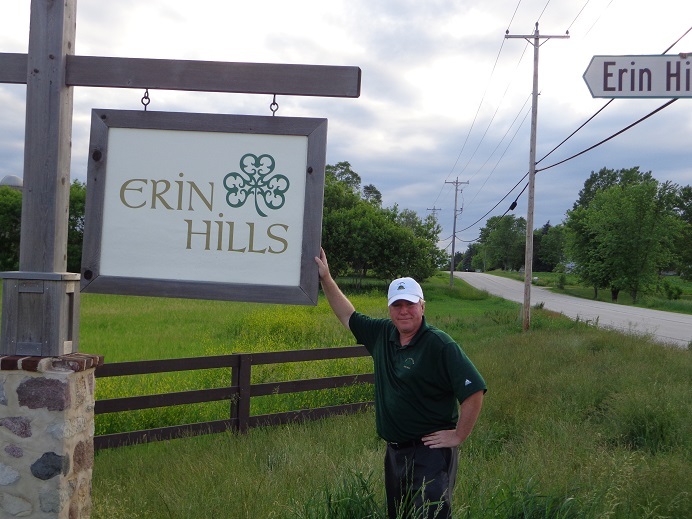 Follow Rory to places like Erin Hills home of the 2017 US Open, on Facebook, Linkedin and Twitter @GogBlogGuy. Dustin Johnson your 2016 US Open champion. Really, after all the near misses, Johnson finally came though but it was not first without some drama. Johnson spent much of the final round wondering if he was going to be penalized due to his putter touching a resting ball on the 5th green. The drama played out back and forth through out the round like a circus, as the story of the final round and Johnson’s possible first major started to unravel, you had to wonder what those wondering to take up the game or not had to be thinking. Yes I get it the that the USGA is about making and keeping the rules, but seriously what in the world is happening at Far Hills New Jersey. The United States Golf Association turned the final round of the US Open into a circus. The entrance sign to the USGA headquarters and the Golf House museum in Far Hills. I could go into the entire thing about a ball moving on Oakmonts speedy greens, but we all know about how fast they are, and on US Open week. But what happened is turning heads away from the USGA and quickly. Arnold Palmer, JackNicklaus and Tiger Woods were among those lashing out at the USGA for their handling of this mess. 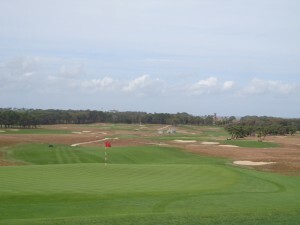 What seemed to be missing most of the week at Oakmont was Mike Davis who seemed to be invisible, but must ave been in the back room negotiating the deals of the 2025 Us Open return to Oakmont and the 2026 deal to return to Shinnecock. The USGA goes to Shinnecock in 2018 and hasn’t even seen how that is going to play out yet, and they are coming back in 2026. Why not announce you are coming back to Erin Hills in 2027 why you are at it. Rich Tock of Erin Hills appeared on our show yesterday, and said there has been no talks with the USGA about a return to Erin Hills. But that Davis likes Erin Hills, and that Erin Hills would gladly take the open back if it gets offered down the road. I’ll have more to say soon in future column about the lack of respect shown towards the Midwest by the USGA when it comes to US Opens. USGA President Diana Murphy who made the announcement of the two new US Open sites, has taken some heat on social media for her appearence at the championship ceremony. It’s been suggested she was slurring words and appeared to be drinking before the ceremony, this was suggested by several people on site and watching on Fox. I have not seen the tape but will view it in the days ahead. The USGA created a mess on Sunday and some cleaning up to do before the next championship it runs, by the way USGA, do you have a contract yet with the Chicago Golf Club for the 2018 US. Sr. Women’s Open. curious minds want to know. 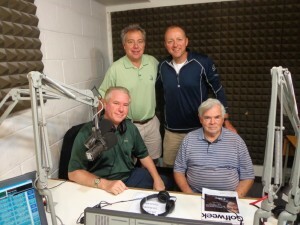 GOLFERS ON GOLF RADIO standing L-R Mike Munro and Ed Stevenson. Seated L-R Rory Spears and Bill Berger at WSBC AM 1240 Studios. 9 AM is tee time. 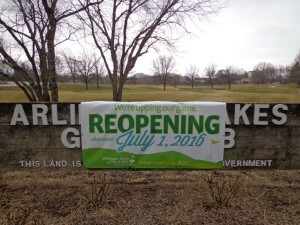 EDITORS NOTE: This column was supposed to run on Sunday June 19th and was ready to go, until the manin frame computer at Golfers on Golf has an untimely death on Saturday morning. We ar sorry for the late posting of this column and we hope you enjoyed our US Open show last Sunday morning. RS. 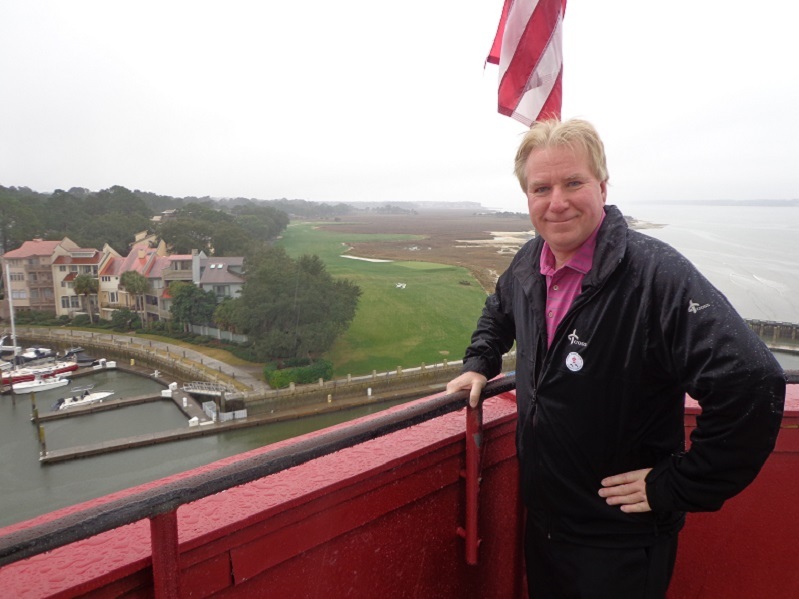 Golfers on Golf Radio is ready for week 10 of our summer season, and it’s U.S. Open show week. 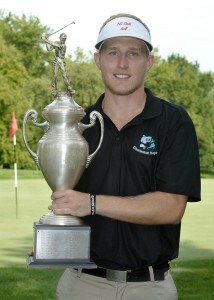 To start things off we will hear about an upcoming charity outing at the Village Links Golf Course that benefits JDRF. 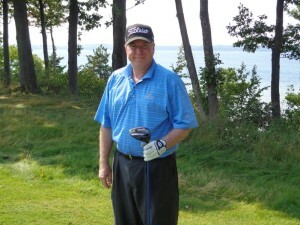 Golf one of the best ways t give back to charity, raising the dollars and more. OUR US OPEN SHOW TEE’S off at 9 AM on AM 1240, WSBC Radio Chicago. Our guests today include the first lady of New York Golf radio Ann Liquori, who is covering the US Open live at Oakmont. She joins us from the media center at Oakmont, for a full recap of the championship and more on the announcement of yet another return to Oakmont in 2025. As we reported yesterday. ON THE CLOCK is 2017 US OPEN site Erin Hills once the final putt drops at Oakmont today or tomorrow if a playoff is needed. Golf rpofessional and Erin Hills marketing guru Rich Tock will join us from Wisconsin to tell his observations of his week at Oakmont and what’s coming to Erin Hills in June of next year. David Cooke 2015 Illinois Open Champion (L), and Madasyn Pettersen Illinois Women’s Open Champion in 2015 (R) with Mistwood GC owner Jim McWethy. David Cooke tells Golfers on Golf he will return to defend his title in 2016 at the Royal Fox Golf Club that he has never played. If Cooke qualifies for the US Amateur he will play again this year as an amateur. Ifnot hewill trun professional and take a shot at thefirst place prize money he missed out on last year. 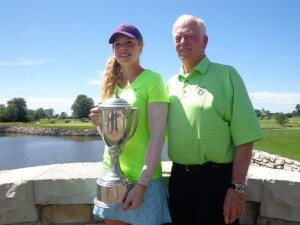 Madasyn Pettersen regrets she will not be back at Mistwood this summer to defend her title. Petersen is playing in more higher level junior golf events and some USGA women’s qualfiers for USGA championships and the 2016 IWO did not fit into her schedule. She feels this summer is key to earn a top level Division 1 school college scholarship. She hopes to return to the IWO and Mistwood in 2017. THE GOG BLOG BY RORY SPEARS, Editor and Director of Content. Follow Rory on Facebook, Linkedin and Twitter @GogBlogGuy. 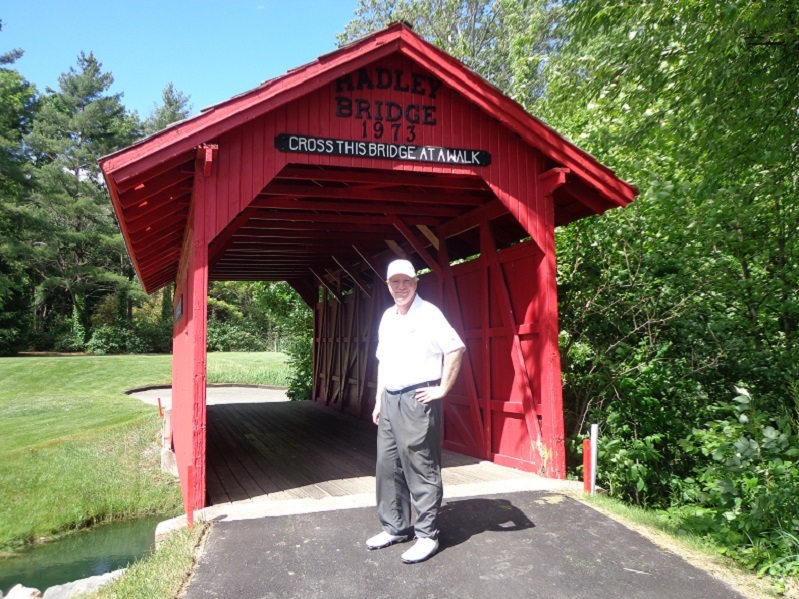 On the bridge at Crooked Stick Golf Club home of the 2017 BMW Championship. EDITORS NOTE: This story was about to appear on this website on Saturday morning, when the main computer in the office of Golfers on Golf had it’s keyboard die. So Golfersongolf.com is playing catch up wit a loaner machine for the next two weeks, while our mainframe is in for reparis. We appreciate your understanding and will continue to post when we can. We expected to be back up and running at full speed around July 5th. While there is never a good time for things like this to happen, in the height of golf season and U.S. Open week is the worst. The famed chruch pews of Oakmont, and the 2016 US Open logo. Back again so soon. Sources have confirmed to Golfers on Golf that the 2025 U.S. Open will return to Oakmont Country Club. This announcement could be mde as soon as this weekend by the USGA before the U.S. Open leaves town. Stay tuned. Later on Saturday afternoon, while appearing on Fox Sports during the broadcast in Round 3, USGA President Diana Murphy made the announcement of the 2025 Open returning to Oakmont. She then went on to say the USGA has made the decision to return to the famed Long Island Club of Shinnecock in 2026. 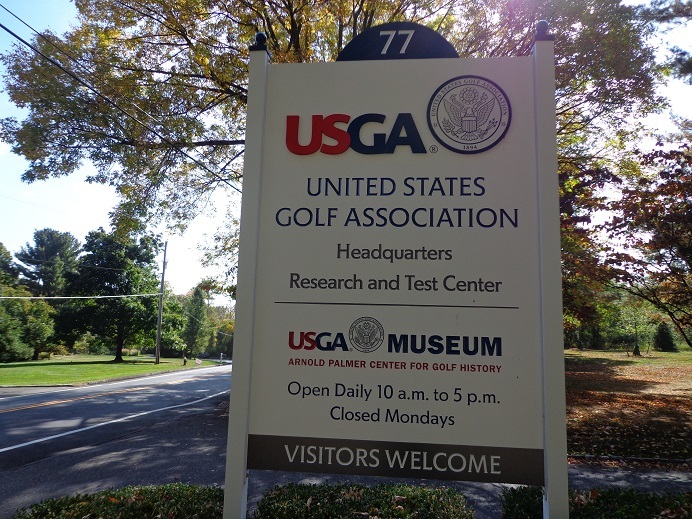 The USGA had planned on taking the year off from making more US Open future site announcements, but apparently decided they could not wait to announce these two more years. The LPGA this past week hedl media day for the upcoming UL International Crown, that will be played at the Merit Club in Libertyville. during the week of July 18-24. This match play team championship is being contested for the second time. In 2014 the inaugural crown was played at Caves Valley CC outside of Baltimore. The Crown in 2014 was captrued by Spain, but the defending champions will not be in the field this year, since they did not qualify. Sweden that took second place in 2014, is not back in the field either. this sets up a wide open race coming up at the Merit Club. This year as in 2014, there are two pools of teams. POOL A is #1 seed Korea, #3 seed Japan, #5 seed Chinese Taipei, #7 seed England. POOL B is #2 seed USA, #4 seed Australia, #6 seed Thailand, #8 seed China. World #1 player Lydia Ko and her nation of New Zealand are not in the field. The press conference started with opening remarks by Kraig Kann of the LPGA Communications department. Some questions were taken from fans communicating with the conference on facebook. Representatives of Thailand were on hand to support the players from their country. Click here to hear the press conference at Top Golf in Addison this past week, narrated by LPGA communication director and Chicago native Kraig Kann. What players are there. To name a few Inbee park of Korea, Lexi Thompson from the USA, Haru Nomura of Japan, Australia Karrie Webb, Chinese Taipei Yani Seng, England Charley Hull, China Shanshan Feng, Thailand Ariya Jutanugaran to name a few. if ou would like to know more about the full UL Crown field or need tickets for the mathes, please visit ULcrown.com. 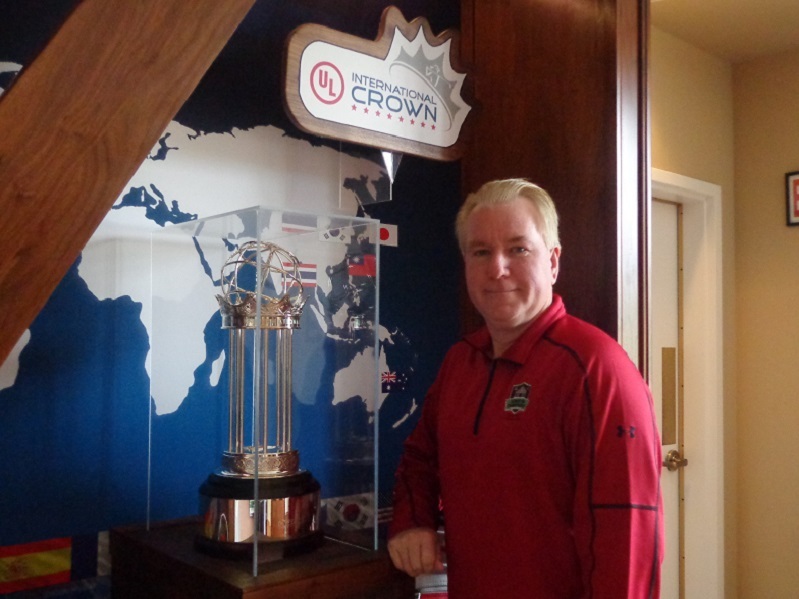 The only only UL Crown schedule in the years to come is in 2018, and it will be played in South Korea, there is no timetable as of yet for it to be played in the United States again. The next chance is for 2020, but that site is still undetermined. The Gog Blog by Rory Spears, Editor and Director of Content. Follow Rory on facebook, linkedin and twitter @GogBlogGuy. Erin Hills is now 1 year away from hosting the US Open. 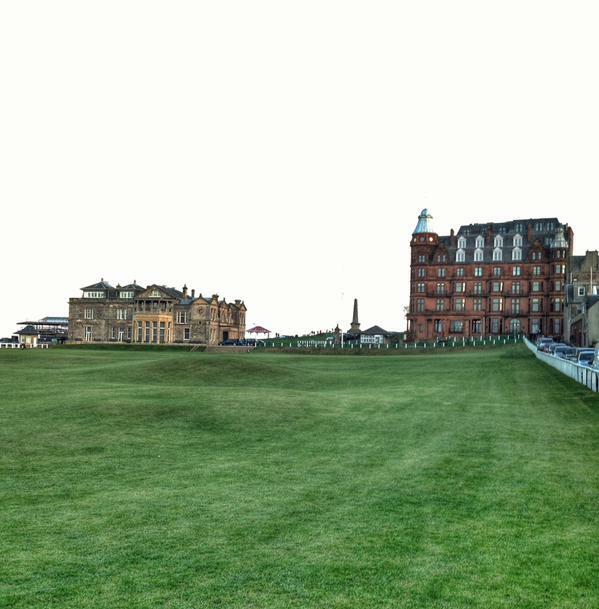 As the world of golf changes, so do golf courses. golf course designer Tom Doak is one of those people who likes to keep coming up with something new. 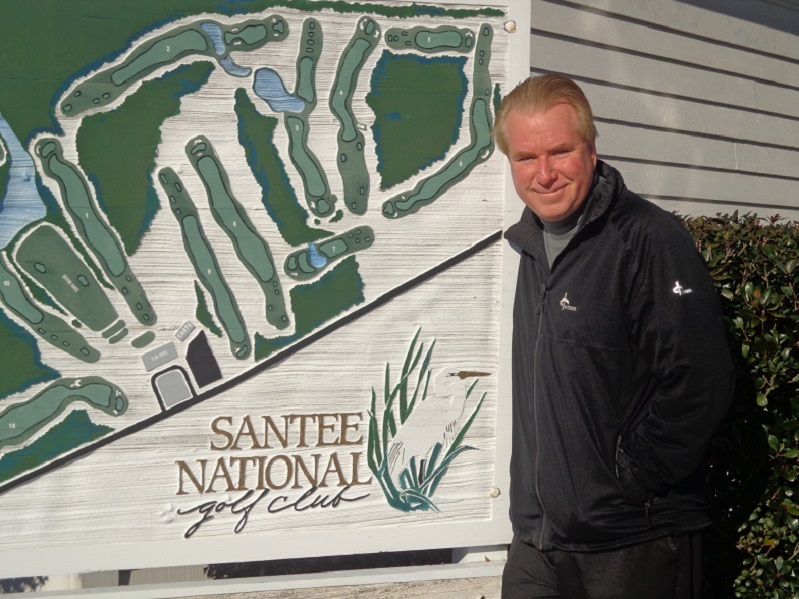 After spending years trying to find the right piece of land, and the right owner to accept his idea, Doak finely found himself building a golf course that is two golf courses. Doak created the reversible golf course, and built it on the property of a Top 100 course created by another Tom, Weiskopf that is. The Reversible Course routing on Display at the Chicago Golf Show in Rosemont. 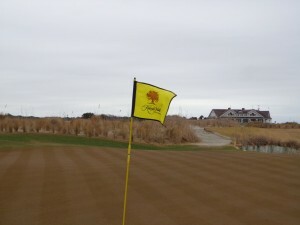 The new reversible course has been named the “Loop” and it will open on Monday June 27th. So for the first time in 20 years, a Doak course will open in his home state of Michigan. New general manager Chad Maveus says the course is different but fun. “One of the goals with creating this new golf course was to make Forest Dunes a golf destination where golfers from around the country would want to come and stay for multiple nights and have a unique golf experience versus just passing through,” said Maveus. “What we have now with the Loop is in essence three golf courses and a golf package that will allow golfers to stay two-nights and play all three courses. Forest Dunes Par 4, 17th hole, that can be driven. On the Weiskopf course. Doak is hoping that golfers think the course is fun, regardless of which direction they play it in. 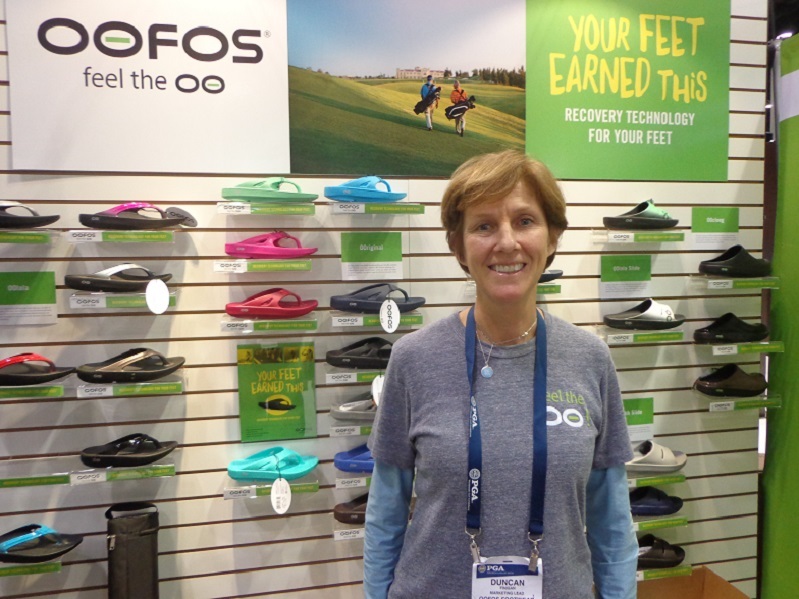 The Loop will be a walking only experience with the option of professional caddies. The different directions of the course will alternate on a daily basis so golfers can have a 54 hole golf experience at Forest Dunes. The Loop is nestled in the 1300 acres Huron National Forest. Formore information please visit Forestdunesgolf.com or call (989)-275-0700. 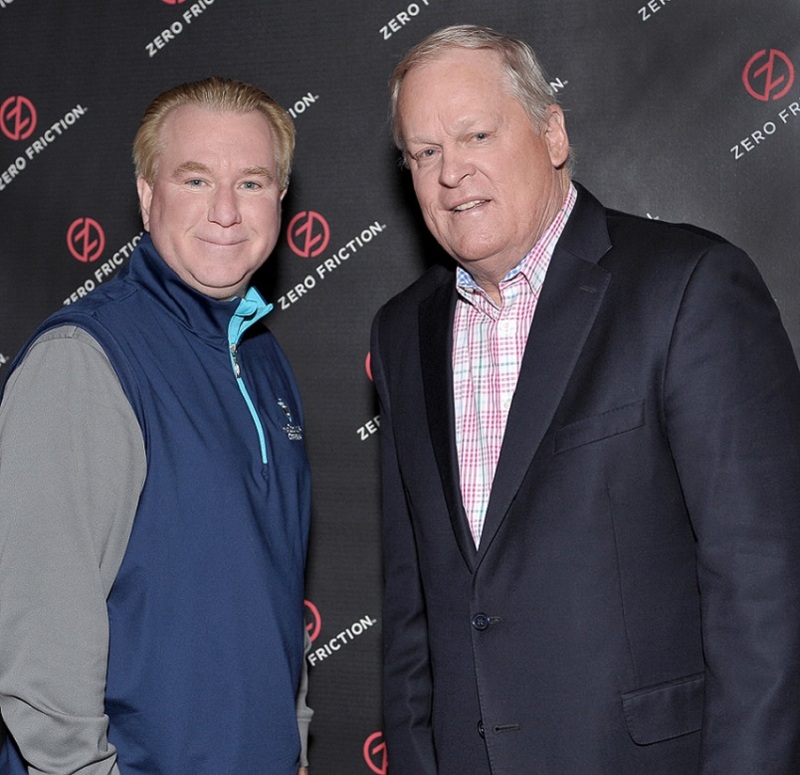 THE GOG BLOG by Rory Spears, Editor and Director of Content with former US Open champion at Oakmont Johnny Miller. Follow Rory on facebook, linkedin and twitter @gogblogguy. The 116th U.S. Open at Oakmont is off to a wet start, as Round 1 is in it’s third rain delay. For the grounds staff and the USGA tournament committee headed up by Executive Director Mike Davis, the product they put weeks of work into, is turning into something they did not wish for. One would hope they would get to finish Round 1 today, but now that won’t happen as the downpour Oakmont is geting is a big one, and the USGA has canceled play for the remainder of the day. FOX SPORTS the USGA broadcast network has been solid now for two straight days of coverage. Fox did an outstanding job on Wednesday during the practice rounds, talking with professionals like Zach johnson and Jordan Spieth on the course as they practiced shots for different locations on certain holes. During the first round the coverage, camera angles and features have very good. Joe Buck, with Paul Azinger and Brad Faxon makes a big difference in the booth, and Holly Sonders looks much better in her pink dress, than the outfits she wore last year at Chambers Bay. The addition of Oakmont Professional Bob Ford and architect Gil Hanse has brought much more to the broadcast. Grade So far “A”. NORTHBROOK BASED Kempersports management is annoucing an ultimate “buddies trip”. 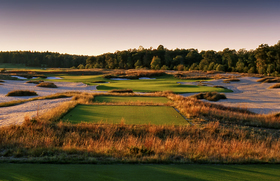 One golfer will win a chance for a Buddies Trip of a lifetime, at a KemperSports property. The sweepstakes runs through Sept. 5 2016. The winner gets up to $10,000 worth of credit in putting the trip together. To enter the sweepstakes which is free, please visit kemperclub.com/ultimate. 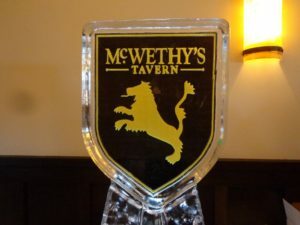 KemperSports and Cantigny Golf in Wheaton has announced a new program to help draw golfers 35 and under out to the golf course. 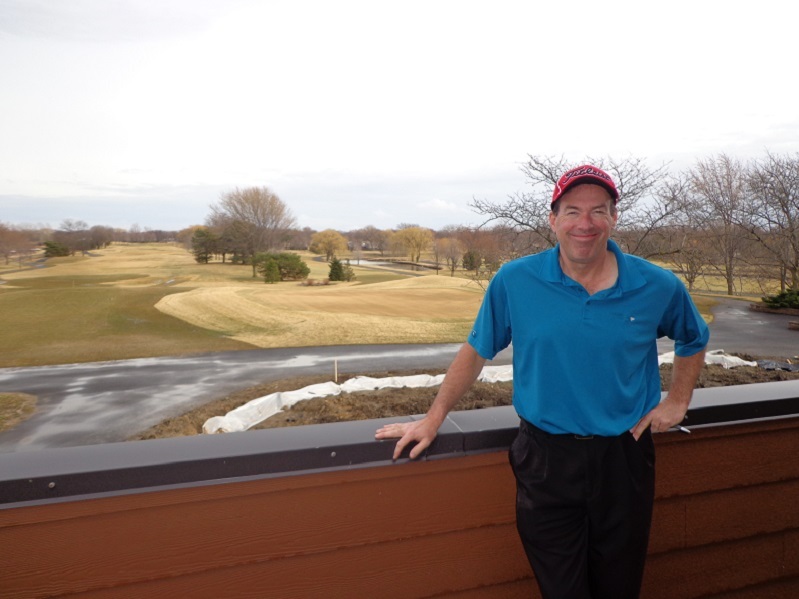 Cantigny’s Golf Young Executive Program, that is amking it’s debut in 2016, offers an opportunity for golfers 35 and under, reduced green fees for round of both 9 or 18 holes. The program that has just tee’d off, is quickly getting a strong response says Patrick Lynch, Cantigny head golf professional. The program is free to join and includes membership in Cantigny’s Red Oak Club, a customer loyalty program that awards points towards free golf and other benefits. Those golfers deemed eleigible for the program can play 18 holes at Cantigny for $75 per player with a cart included. The rate is available Monday through Thursday all day, and after Noon on Saturdays and Sundays. The 9-hole Young Executive green fee is $40, cart included and is valid for any available 9-hole tee time. For more information on the Young Executive Program go online to CantignyGolf.com or call the Cantigy pro show at (630)-260-8197. Cantigny is located on mack Road in Wheaton. The number for tee times is (630)-668-8463. This week you can purchase your tickets to attend the U.S.Open in 2017. 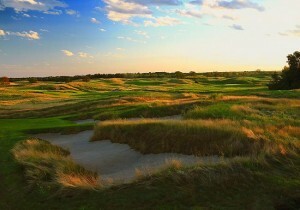 To purchase tickets for the 117th U.S. Open that will be played from June 15-18, please see USGA.org/tickets and or usopen.com. 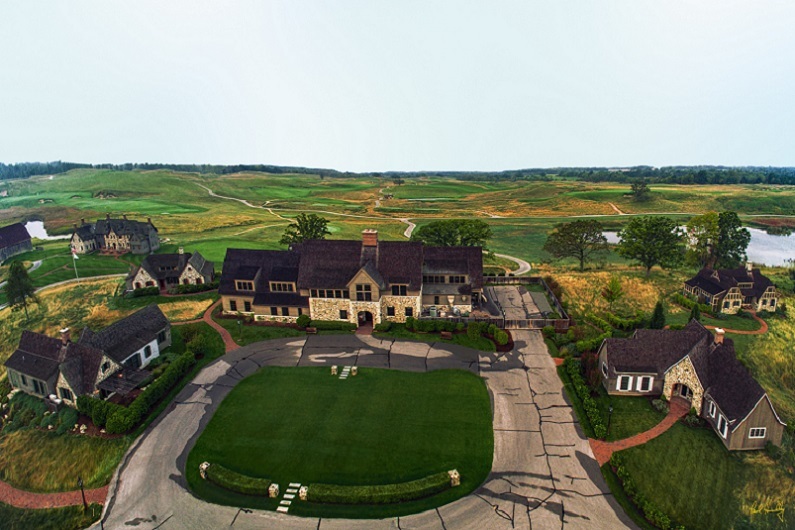 Erin Hills is the first Midwest Course to host the U.S. Open since Olympia Fields in 2003, and it will be the last for several years, as the U.S. Open has been awarded through 2024 without another Midwest location being on the schedule. The prices for tickets at Erin Hills, start with $50 for daily gallery tickets and $100 for package options, respectively include. 1895 Club: The 1895 Club is an all-inclusive ticket option featuring breakfast, buffet lunch with hot entrees, afternoon snacks, and full bar service through out the day in a custom-designed climate controled enviroment. The Trophy Club: Located near the main admission gate, the Trophy Club is a climate controled pavillion offering open seating, live network coverage of the championship in a sports bar-like setting, and variety of food and beverage options available for purchase at an additional charge. Gallery: Gallery tickets provide access to the grounds and to all concession locations, grandstands through out the course and spectator experience facilities. Weekly packages: Each ticket type can be purchased as a weeklong ticket package. All weekly packages include a playoff ticket for Monday June 19th if needed. 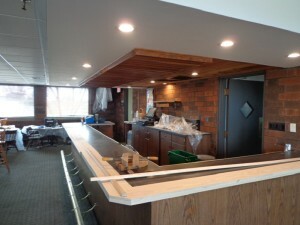 Ticket buyers who purchase an 1895 Club weekly package will receive a playoff Trophy Club ticket, as the 1895 Club will not open if a playoff is required. Practice-Round and Championship-Round packages: Both Trophy Club and Gallery Tickets are available in three-and four-day packages. Erin Hills was designed by Michael Hurdzan and Dana Fry and Ron Whitten, the club opened in 2006 and has hosted the 2008 USGA Women’s Public Links and the 2011 U.S. Amateur Championship. Juniors 12 and under can get free tickets when accompanied by an adult with a paid admission. Juniors 13-17 with paid adult admission can a reduced price on tickets. There are tickets on site for military personnel. Free tickets during practice rounds and gallery tickets for just $25 during the four championship rounds. 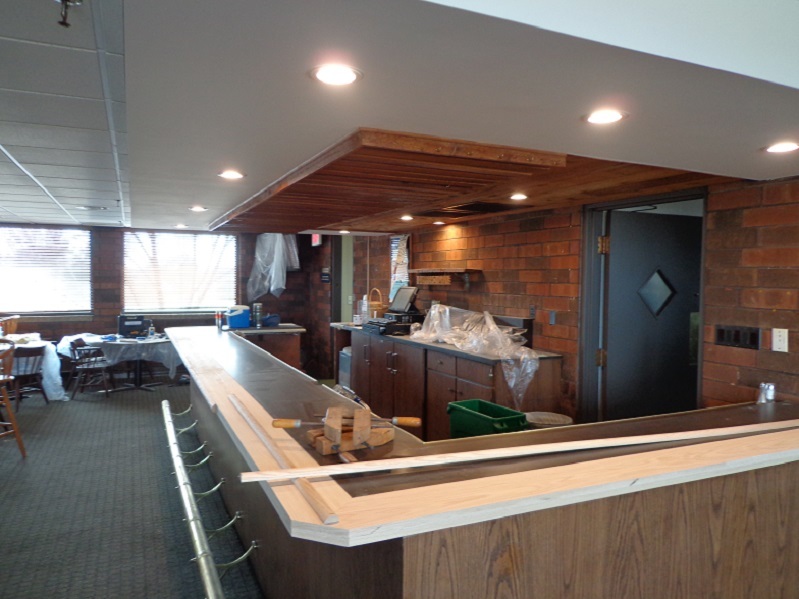 If you have questions regarding tickets you can contact ticketquestions@usga.org or you can call (800)-698-0661. This years 2016 U.S. Open at Oakmont is the 30th consecutive year that the U.S. Open has been sold out. Part 1 was telling the PGA Tour that it was a stupid move to “Dump Trump National Doral” after 54 years for Mexico. Mexico over Miami what were they thinking, well the tour simply was not thinking. Run off to Mexico of all places becuae someone is afraid of Donald Trump. Amazing. Now it seems like it needs to be said again. I’m skipping ahead one open to “The Open” that gets played across the pond next month. The latest victim of the PC movement is Muirfield, that has been told by the Royal and Ancient that they can no longer host an Open because they have no women members. Really this is silly. FIRST UP all the R & A needs to do is follow the path taken by the Augusta National Golf Club, that refused to be bullied by outside organizations or liberal media types in changing their policies or rules. Many of the same people are calling to put an end to bullying, then they go and participate in it themselves. When organizations and media screamed for the inclusion of females at ANGC, the club took it’s time and it got it right. They did not yield to somebody else’s time table, they heard the cries of add ONE female member. So they added TWO female members. Well played AGNC and now everyone has moved forward from a topic that wasted to much time and energy. Muirfield took it’s vote and decided not to allow females for the time being. So the R & A jumped and made a circus of things by saying no Open Championships there until they do allow in women members. The interesting thing is that a majority of the club’s members voted to allow women to join, but not enough to reach the 2 /3rds vote that was needed to make the change. It now appears that Muirfield purposely voted the way they did, because of clueless media types and the garbage that was written on how the club needs to make changes. It’s one thing for media who cover golf who know the working of the game, it’s organizations and public or private clubs to express an in the know viewpoint. It’s another thing for outsiders to come in and demand change, and demand it to happen overnight. 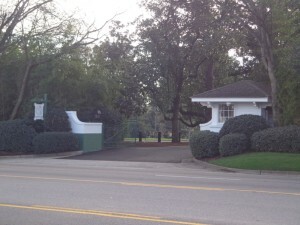 The front entrance to the Augusta National Golf Club home of the Masters. What was worse was the R & A saying anything at all, did they have to. Of course not. The could simply have voted in another direction every year and maybe sending their message of disaproval that way. Muirfield just hosted an open a couple of years ago, they were not due up on the rotation for several years. So why push this issue on them now. If everyone had stood clear, this might all have been cleared up in the next few years, and the club could have done things their way. Which is how all private clubs should be allowed to operate in the first place. Private clubs mean just that, they are private clubs. It’s always amazing that the people who expect private clubs to change their rules to accomondate the feelings of non-members, wouldn’t make the same concession if the bayonet was pointed at them. Some of the all-male golf clubs around the world are softening their stance on women without public pressure, or media columns. Change might be slow, but it’s coming. Now if people not involved in the process would just sit down, shut up, put the keyboard away and let things happen. Things just might start to change a little quicker.